Do you read Harper’s Magazine? You know, the “oldest general-interest monthly in America … with its emphasis on fine writing and original thought … with a unique perspective on politics, society, the environment, and culture”? They published an article back in July 2013, “Poetry Slam Or, the decline of American verse.” I went to check it out but the article remains “quarantined behind a pay wall.” Forget that a public intellectual had written the article, for the question regarding “modern poetry” and its salvation was for a moment on the minds of a few. So, if no one was offering poetry’s diagnosis for free I suppose that goes in stride with the ominous diagnosis that modern poetry and its relevance, after dispatching its Romantic hang-ups, is over. True if we follow the thought that Modernist poetry simply tuned into a hyper-personal, private chamber of alpha state gurgles and irrelevant fancy that offer the masses no vision of revolution. Harper’s pay wall seems to imitate this diagnosis. The myopic situating of poetry and its use, or what it’s for—that poetry has no use value—shows how desiccant the creative guts of any so-called intelligentsia remains. The reality of a pervasive market society has no use for poetry, hence why it is obsessed with asking what things are for. So here we are: Identify yourself poem! Or, poems are for politics just ask the 1960’s, and so on. I follow Wallace Stevens’ reservation about a “chair of poetry” and what institutionalized, academic poesy means; it means we are fools to institutionalize poetry. This is why Balso’s Affirmation of Poetry, is ultimately destined to be ignored in the short term—precisely because it says what most masters and commanders of the poetry industry do not seem to understand: Poems are for poetry and poetry is for thought. That poetry is in itself a type of thinking, and as a type of thinking, a part of understanding what is not knowledge posing the ultimate challenge: to unlearn. Unlearning runs against the grain of so many contemporary notions espoused by technoscience zealots and the occasional asinine popularizer of science. For these are the romantics of science who belittle the use value of philosophy yet unknowingly adopt a one-sided arrogance typical of romantic poets! Science in its popularized mediatic form has discovered its poetic righteousness and in turn reveals a regressive and conservative tenacity. And in that discovery a would-be Rasputin or two are among the living (say Neil deGrasse Tyson and Ray Kurzweil?) They seem the popular poets of our time, running around calling themselves the official view of science! Last time I asked Baudelaire he was quite sure poetry was the ‘queen of all faculties’. This is only one reason to read Balso’s Affirmation. Another is that the contents were in part developed from seminars given at the European Graduate School, and you won’t find this anywhere else in the world unless you are a spirit medium. Make no mistake, Balso’s ideas must be studied and Affirmation is not a book with the life span of a frozen pizza. 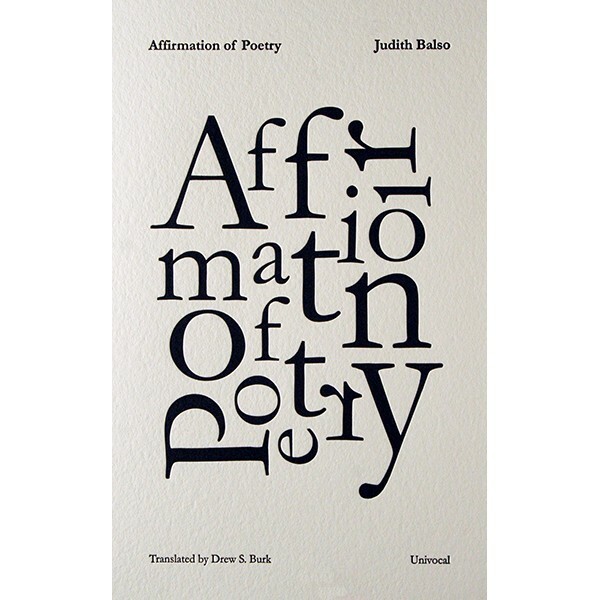 Balso’s Affirmation surveys seven figures of poetry: Wallace Stevens, Xi Chuan, Gennadiy Aygi and Osip Mandelstam, Alberto Caiero, Pier Paolo Pasolini and Giacomo Leopardi, poets who generate specific elements of the abovementioned criteria. From such poets and the thoughts generated by their poem-portals the possibility of something “global” stands forth, yet not reduced to a “general declaration” regarding the “power of poetic work.” Poetry presents the human with a task, an offer for thought for what it speaks of: that poems represent “the immense reservoir that [poetry] constitutes” something peculiar that “has … hardly been, truly explored.” A matter of suspending disbelief Balso’s affirmation situates the human in regards to poetry beyond market mores. Poetry seems the logical augur of an unfound exterior, outside a pervasive ordering of the natural world, not contrary but beyond the inanity of “those powers” that endorse and implement the derisory calculation of nothing less than what it defines as everything. Judith Balso. Affirmation of Poetry. Minneapolis: Univocal, 2014. Adam Staley Groves is a lecturer and Fellow with Tembusu College, National University of Singapore. Adam received MA and PhD degrees from the European Graduate School, Switzerland. Adam’s current research with the Univeristy of Aberdeen’s Centre for Modern Thought explores the relationship between poetry and technology.